St Ivo Geography Department follow the new AQA GCSE specification. 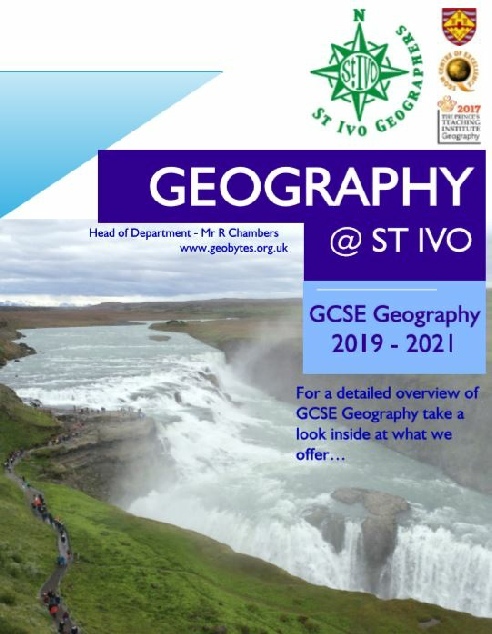 Geography is an extremely popular option at St Ivo with 180 geographers in Year 10 and 172 inYear 11. We appreciate that options time can be difficult with so much to choose from. To find out more about the GCSE Geography course, including more about the department, an outline of the course, and the benefits of studying Geography at GCSE level, please see our online brochure opposite. The 2019-2021 course brochure is now live and the Year 9 Curriculum Evening is on Thursday 7th February - we look forward to welcoming both students and parent/carers into the department to discuss the Geography course and what it entails. We will be based in N16 in the Geography Department. If you have any questions please get in touch with your geography teacher or email the department here.